Aosta Valley sightseeing is focused on outdoor alpine activities. During the summer months it is a hiking and fishing destination. During the winter months it is a popular skiing destination. The Aosta valley is located at the foot of Mt Blanc, in northwestern Italy, bordering Switzerland to its north, France to the west, and Italy’s Piedmont region to the south and east. Given its altitude and the fact that the mountains block any sea air from getting into the valley, it is Italy’s coldest region. Its winters are quite cold. With Medieval castles and beautiful valleys set among the highest peaks in the Alps, this region is a high altitude oasis with panoramas of incomparable beauty. For more information about planning a trip to the Aosta Valley watch the video below. Travelers to the Valle d’Aosta will find Italian and French are both official languages. 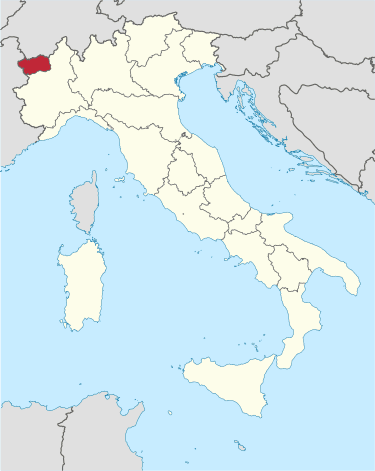 Located on France’s border, it is Italy’s smallest region. Notable wines include two white wines from Morgex (Blanc de Morgex et de La Salle and Chaudelune), a red wine blend from Arvier (Enfer d’Arvier), and a Gamay. Each year in May the Giro d’Italia typically rides through the mountains of the Aosta Valley. For mountain enthusiasts summertime brings hiking, nature watching, and splendid views. And during the winter the area attracts skiers worldwide who want to ski the highest peaks in Europe, including Mont Blanc. Courmayeur is the most people ski resort in the region. It boasts over 100 miles of ski trails. Its trails are known for being long and range from expert to beginner. During the summertime the area may be hiked. And the town is always fun to stroll. The Aosta Valley is also popular for travelers who want to visit castles. The typical Aosta Valley castle itinerary includes castle Sarriod de la Tour at Saint-Pierre, castle of Sarre, castle of Fénis, castle of Issogne, Savoy castle at Gressoney-Saint-Jean, Gamba castle at Châtillon, and castle of Verrès. These castles set among the mountains make Aosta sightseeing magical. For more information about Italy trips to Northern Italy check out the Northern Italy tour packages page.